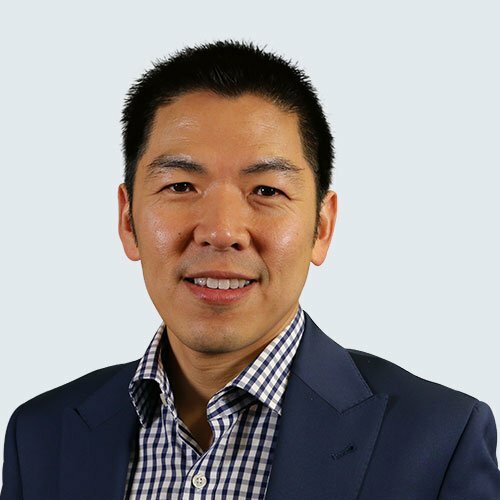 As I sit at my desk staring out the window at a bright, sunny day, I thought I'd share some slides and thoughts from the review course I attended at the recent ACR Conference in San Diego. Blue Digits do present to rheumatologists. With our moderate Sydney climate, this is not a regular presentation (luckily). It tends to occur around winter and in the context of either confirmed or suspected autoimmune disease. 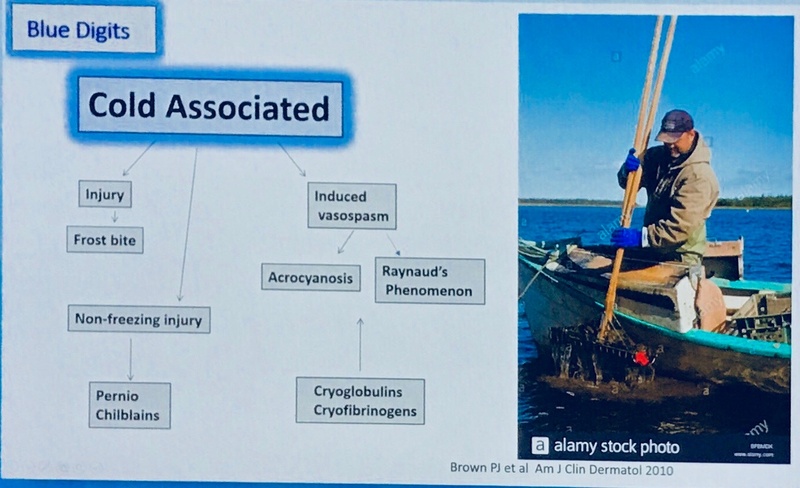 Here's a summary slide which gives a simple schematic for thinking about cold-associated blue fingers and toes. Rheumatologists are often asked to help manage Raynaud's Phenomenon. Primary Raynaud's phenomenon, also called Raynaud's disease, is the most common form. There is not an associated medical condition. It can be mild and can resolve on its own. 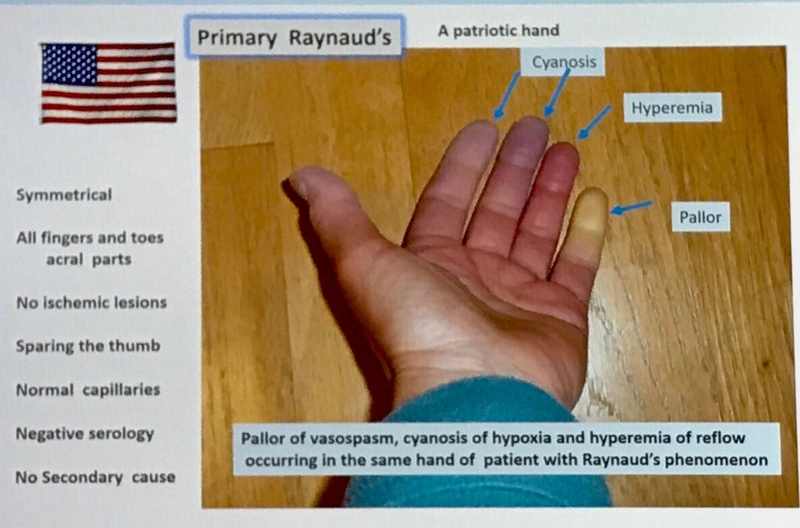 Secondary Raynaud's phenomenon is caused by an underlying problem. Signs and symptoms of secondary Raynaud's usually appear at a later age, around 40.
such as scleroderma, lupus, Sjogren's syndrome and rheumatoid arthritis. such as atherosclerosis (plaque build up in the arteries), Buerger's disease. examples include activities such as excessive typing or playing piano and operating vibrating tools, such as jackhammers. includes wrist fracture, surgery or frostbite. includes beta blockers, used to treat high blood pressure; migraine medications that contain ergotamine or sumatriptan; attention-deficit/hyperactivity disorder medications; and drugs that cause blood vessels to narrow. 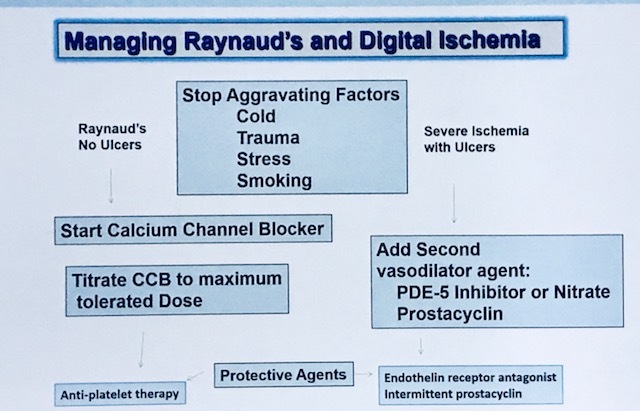 With secondary Raynaud's phenomenon, we would usually attempt to fix or improve the underlying problem (where possible). 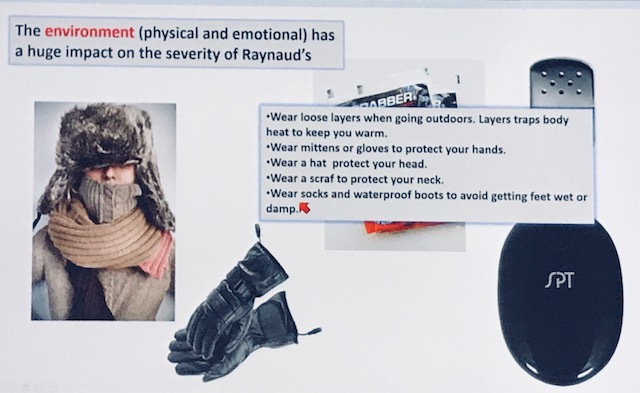 Raynaud's phenomenon can be really frustrating for both the person suffering it and for the rheumatologist attempting to help it. Warmer weather helps so we're looking forward to summer down under. What's your experience of blue digits?